Paul Stanley and Gene Simmons, co-founders of KISS, have an ambitious worldwide restaurant strategy for their co-owned franchise, Rock & Brews. The dynamic rock titans recently opened their third restaurant and second Los Angeles area location in a year, furthering their plans to open an impressive 100 more in five years. Stanley is excited about the rapid expansion of the Rock & Brews brand. 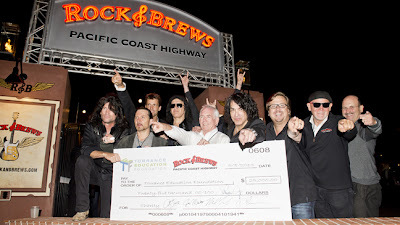 Rock & Brews PCH joins the brand’s growing roster that includes its flagship location in El Segundo, Calif., which opened in April 2012, and the first international location in Los Cabos, Mexico, which debuted in March. Locations opening in the next 12 months include: Rock & Brews LAX (California) opening later this summer (in the Delta Airlines Terminal); Rock & Brews Maui (Hawaii) and Agoura (California) which will open this fall; and Rock & Brews Kansas City (Missouri), which is slated to open early next year. During the Torrance restaurant’s opening, held on Thursday, Stanley and Simmons hosted and personally served more than 100 returning military veterans and Wounded Warriors at a luncheon honoring them. The event kicked off with a Military Color Guard ceremony and national anthem. Later that night, the two hosted an opening gala, with all proceeds benefiting the Torrance Education Foundation. A $25,000 check was presented last night to TEF President Tom Brewer. KISS played a three-song set, performing "Hotter Than Hell," "Rock and Roll All Nite" and "Lick It Up." Simmons described the restaurant as "on fire"